Whenever I go on beautiful mountain drives – for example, Going to the Sun in West Glacier, Montana – I revel in the treasures of beauty, from glaciers to blades of grass, waterfalls to rock formations. Often on one of these types of sojourns, I view what I imagine must be the closest thing to God’s glory here on earth. Yep, heaven on earth, if you will. Unspoiled. Pristine. You know, all except for the road covered in asphalt which allows my car to carry me there in relative comfort. Sometimes on these drives, I will also let my mind wander a bit about being a “pioneer woman” or an explorer or even someone who bravely worked to carve out the road on the mountainside on which I now drive. Well, let’s be honest – my husband drives on those curvy roads. I’m good at other things. My point is…someone first had to bushwhack his or her way through the wilderness to see the beauty set before him/her. The beautiful mountain views in Montana have always existed, but it took some courageous souls to clear the path to make this vista available to themselves and to the rest of us. Many people making these types of roads probably never saw the finished product; perhaps others lost their lives while in the midst of clearing the path. However, I know that the mountain path wouldn’t have been cleared at all if no one took that first step to clear it. The first path-clearers weren’t able to see the end of the project, but I bet they kept seeing enough progress – enough clarity, if you will – to continue on. And this progress, in my estimation, might have given them the motivation to keep going, even if their muscles were tired and they were bone-chilled cold. Bushwhacking is uncomfortable. There are rocks, thorns, wild critters that bite and sting, and weather conditions are often unfavorable. Bushwhacking is risky. Sometimes one can stumble, fall, or even lose one’s life in the process of clearing away the debris. The view that Abraham saw when he trusted God even with the life of his beloved son, Isaac. The view that Moses saw of the Promised Land, from a mountain of Abiram, after following God’s leading to lead the Israelites out of the wilderness of Egypt. While God didn’t allow Moses into the Promised Land because of sin, God gave him a glimpse of its beauty. Joshua was allowed ahead, though. God used him to make a way for the Israelites to get to the place He had arranged and set aside for them. The view the Wise Men and the shepherds had when following the star to catch the first glimpse of the Messiah. Can you even imagine? The view Peter, James, and John had at the transfiguration, seeing Jesus, Moses, and Elijah in glory?– wow! The view John describes in his visions of heaven in Revelation. To be clear, I’m using the term ‘bushwhacking’ in both the true and metaphorical sense. Obviously, not all of God’s faithful followers used a scythe, shovel, or chainsaw in moving forward along the path God set out for them, although some of them did deal with their share of wilderness conditions. For me, ‘bushwhacking’ denotes taking that first step into the unknown. Now, while I have the image of being on that beautiful mountain drive firmly in my head, let me also share that I would NOT have been a good pioneer woman. Nor would I have fancied myself much of an explorer or manual laborer, for that matter. Birthing two children was plenty of labor for me, if you know what I mean! I like my conveniences – iPhone, microwave, car, paved roads, warm home, comfy bed, chocolate, Netflix, etc. Yes, the words ‘spoiled brat’ come to mind. Or, perhaps ‘creature of comfort’, if you prefer. But here’s the thing: I’m learning that for my walk with God, at least, clarity requires faith, and faith requires trusting God to hold me while I take that first step in bushwhacking through the wilderness – whatever that wilderness is. And generally? The wilderness is not comfortable. In the Gospels, Jesus says that in order to live our lives for Him, we must first lose them by giving them up. Now, I’m not advising that we all sell our houses immediately and live in huts “down by the river”. But I am suggesting that maybe we (Americans especially) are so accustomed to having our needs met and our lives fairly sanitized that we don’t bushwhack unless some horrible thing forces us out of our comfort zone and into the unknown. The first Disciples had no creature comforts, they had, “Follow me, and I will make you fishers of men.” They didn’t have amazing homes because Jesus had no place to lay his own head. No, in order to follow Him, they bushwhacked into the unknown – new relationships, new beliefs, new teachings, new jobs/purposes. Oh, and many were tortured and martyred in Jesus’ name. Imagine the view they have now, up in heaven, with their King! They rest and work in Paradise because they chose to believe. They chose to step out in faith by trusting the One who loved them the most. The view was always there for them. They just had to clear their way by listening to, believing, and obeying the Son of Man. They chose to step out in faith by trusting the One who loved them most. I’d like to encourage myself and anyone reading to think of one step we could take to start bushwhacking onto the path set before us. Jesus wasn’t safe. He all but tells us that our comforts mean nothing to Him. Why? Because He is our comfort. He is our safety. He is our strength. After this I looked, and there before me was a door standing open in heaven. And the voice I had first heard speaking to me like a trumpet said, “Come up here, and I will show you what must take place after this.” 2 At once I was in the Spirit, and there before me was a throne in heaven with someone sitting on it. 3 And the one who sat there had the appearance of jasper and ruby. A rainbow that shone like an emerald encircled the throne. 4 Surrounding the throne were twenty-four other thrones, and seated on them were twenty-four elders. They were dressed in white and had crowns of gold on their heads. 5 From the throne came flashes of lightning, rumblings and peals of thunder. In front of the throne, seven lamps were blazing. These are the seven spirits[a] of God. 6 Also in front of the throne there was what looked like a sea of glass, clear as crystal. “He all but tells us that our comforts mean nothing to Him.” I love the thought of bushwhacking away from some of the comforts, into the unknown territory. But bushwhacking, for me, has been in my spiritual journey – letting go of the crap I keep that I don’t need to (but do because it’s still a comfort in some masochistic, egocentric turn! ); or realizing that a comfortable behavior is actually sinfully hurtful to others (ouchies! ), and…too many to write. I take your challenge to identify a bushwhacking target and take that step. 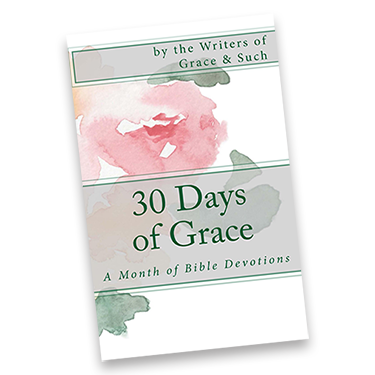 Grace and Such Writers: Bushwhackers at Heart!! Wow! What a powerful metaphor. Thanks for sharing!